Chicory is a challenging green to work with in the kitchen. Notable for its bitterness, it mellows somewhat when cooked. An especially lovely dish is chicory slowly braised with onions and olive oil. The greens become meltingly tender and sweet. Here, I’ve paired wilted chicory leaves with shallots, olives and orange in a light salad that can be served as an appetizer or side dish. Fill a small bowl with ice water. Bring a pot of lightly salted water to a boil. Add shallots. Reduce heat and simmer for 3 to 4 minutes. Drain, then plunge shallots into the ice water. Drain again and slice shallots into wedges. Melt butter in a large skillet over medium heat. Add shallots to the pan and cook, stirring frequently or until shallots become golden brown, about 3 minutes. Remove from heat and set aside. 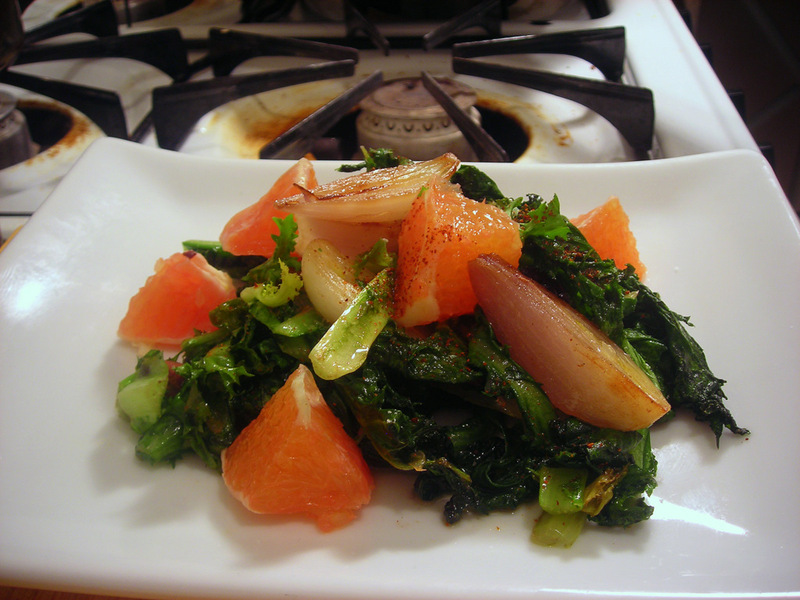 In the same pan, add chicory leaves and toss. Let leaves wilt slightly and remove from heat immediately. If you leave the chicory in the pan for too long, the leaves will wilt completely. Place chicory in a salad bowl. Add shallots, olives and blood orange segments. Toss. Whisk together blood orange juice, lemon juice and olive oil. Taste for salt and add a touch of cayenne pepper. Dress salad with salad dressing. Serve at once. Time: 30 minutes, including prep. 06 Jan	This entry was published on January 6, 2012 at 4:03 am. It’s filed under food, general, vegetarian, winter and tagged appetizer, chicory, dinner, food photography, salad. Bookmark the permalink. Follow any comments here with the RSS feed for this post. No idea if I like Chickory or not. But the salad looks AMAZING! I will take a serving, please.